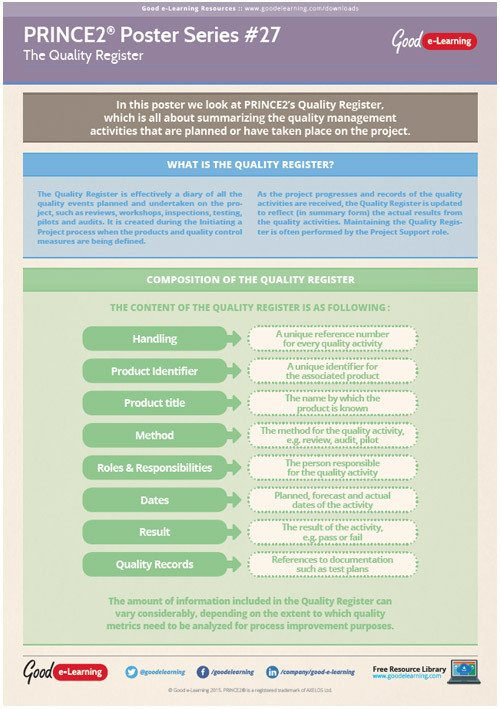 In this poster we look at PRINCE2’s Quality Register, which is all about summarizing the quality management activities that are planned or have taken place on the project.be met, but should not be so detailed that it leads to an increase in the cost of quality. The Quality Register is effectively a diary of all the quality events planned and undertaken on the project, such as reviews, workshops, inspections, testing, pilots and audits. It is created during the Initiating a Project process when the products and quality control measures are being defined. Register today to download this free project management poster. You’ll also gain instant access to our entire library of Business and IT learning resources!